Summertime in Paris can sometimes be a real grind for American tourists. It’s the pinnacle of high season when the majority of families coordinate their kids’ vacation with time off from work. If going with the flow isn’t your strong suit, the energy can be unbearably crushing. 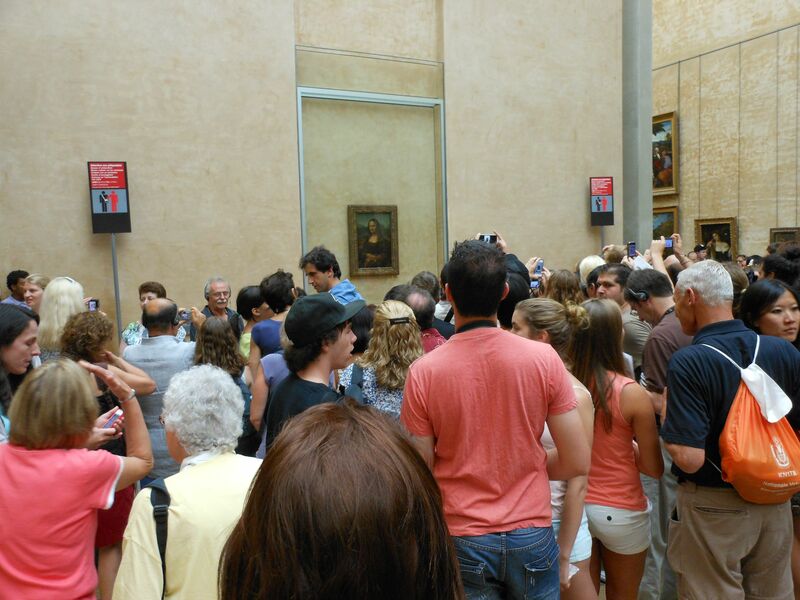 Most museums can be inundated with tourists from everywhere. The metro can be packed like a can of smelly sardines with vacationers and locals alike. It becomes even more complicated because so many Parisians are also en vacances. Typically, the French have 5 weeks of paid vacation. While some may break up that time, many take a big chunk all at once. There are juilletistes, who take off the month of July, but most are aoûtiens, who choose August for their holidays. Did you want a croissant or a tarte aux pommes today? Well, the neighborhood boulanger may have disappeared for a couple of weeks or an entire month, so you’ll need to find a different baker. Do you need to find a papeterie? Sorry, no pens or paper for you. Hungry for dinner? Sadly, your favorite restaurant is a temporary non-option, as are the four other restaurants on that street. What’s a visitor to do? Don’t fret. You’re in a capital city, and life continues to thrive, even when half the city is on vacation. There are twenty arrondissements or districts to explore that will always have a wealth of activities, restaurants, and markets available to you if you’re willing to explore. While time off is a sacred rite in France, there are nonetheless, businesses that, because of the decreased competition, benefit from choosing to stay open during the summer vacations. If you keep your cool and take advantage of the numerous opportunities to enjoy the city in an atypical-for-tourists kind of way, you’ll find that you’ll have a more rewarding visit in Paris by doing as the locals do. And especially for those who have been to Paris before and have already done the standard must-see/must-do things, it behooves you to ditch the pre-requisite itinerary. Don’t just be a tourist in Paris. Get into living a Parisian lifestyle. In fact, in the last few years, because so many French have had to be more conscious of their national and personal economic situations, they don’t necessarily go away on vacation. Many Parisians choose to (read: have to) stay in town and do what we now call a “staycation”. The mayor of Paris, Bertrand Delanoë– a forward-thinking politician – has implemented creative ideas for his fellow citizens to enjoy their vacances without ever having to leave the city. The most notable of these visionary ideas is Paris–Plages or Paris Beaches. 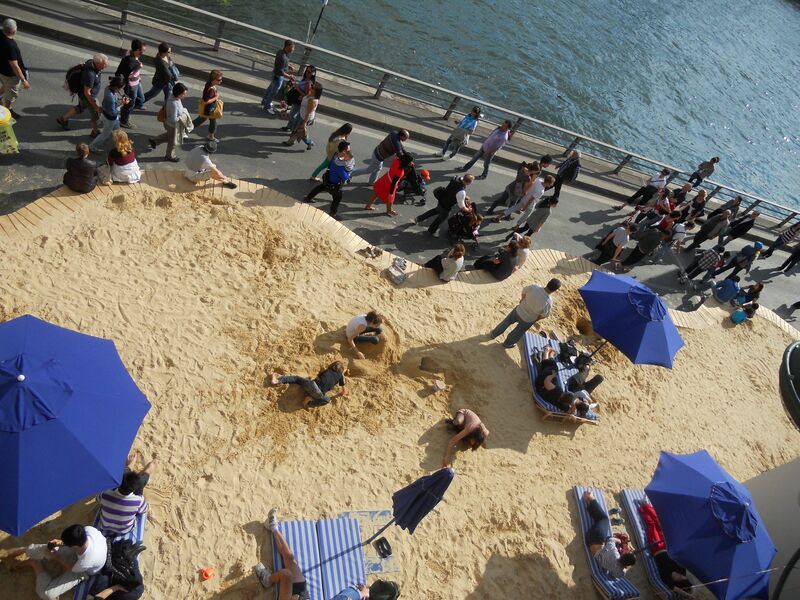 Every summer since 2002, the city trucks in 2,000 tons of sand, loads it up along 800 meters of the Right Bank of the River Seine, and dots it with sun umbrellas, lounge chairs, palm trees, showers, volleyball and pétanque courts, food vendors, and outdoor cafés. There are daily city-organized concerts as well as impromptu mini-concerts from nomadic musicians hoping you’ll spare them a euro or two. Some temporary swimming pools sites are also set up near city center. Due, in part, to the ever-increasing popularity of Paris-Plages with locals and visitors alike, development plans are in the works for Les Berges de Seine or the Banks of the Seine, which will expand and create new permanent spaces along the riverbanks and will provide pedestrian only esplanades, dining, leisure, and entertainment venues to be enjoyed throughout the year. 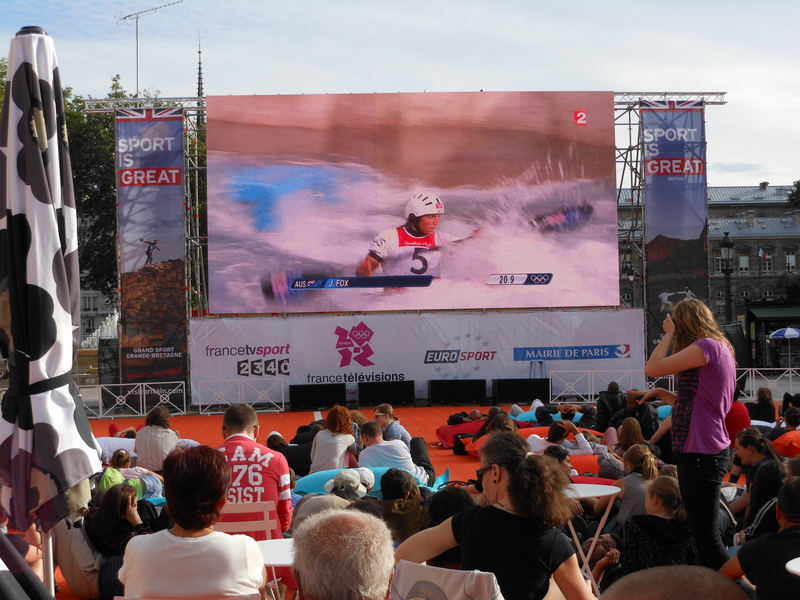 Local and visiting spectators enjoying the Olympic Kayaking event at Hôtel de Ville. In conjunction with the beach scene, the square at L’hôtel de Ville or town hall is another vibrant location for Parisians looking for summertime distractions. Typically, a large stage is set up for free concerts. Various bands play throughout the day and night, and music lovers of all shapes, sizes, backgrounds, and socio-economic levels mingle together, swaying their hips, snapping their fingers, bobbing their heads, or whoot-wooing to the music. This year, to coincide with the Olympics, people can gather in front of a massive screen showing the day’s competitions. It’s exhilarating to get caught up in “the thrill of victory and the agony of defeat” with your multi-lingual spectators yelling things you can easily imagine would be criminal if it came out of the mouths of their children. One of my favorite summertime activities in Paris is to watch movies under the stars. At le Parc de la Villette, outdoor movies are hosted Wednesday night through Sunday night on an expansive lawn in front of a screen that’s nearly as expansive as the lawn. 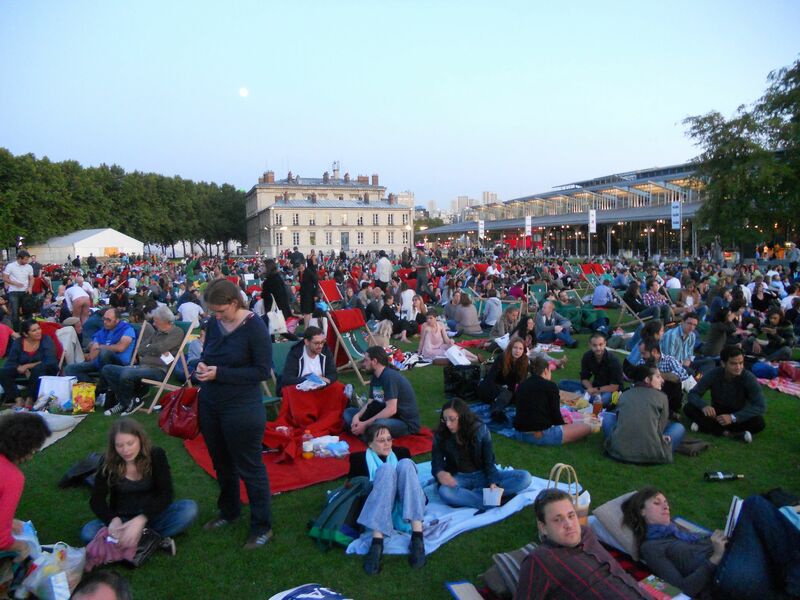 Thousands of people show up with their bottles of wine, baguettes, cheese, pastries and other picnic nom-nominess to share with their friends – and even with strangers – as they lounge on picnic blankets and delight to the sights and sounds of the film flickering in front of them. While it’s mostly locals enjoying this activity (most films are in French, but English-language films are popular, too), it is open to anyone and everyone daring enough to break out of their physical and mental comfort zones to head out to the 19th arrondissement. People show up early to stake their picnic space claim at le Parc de la Villette. 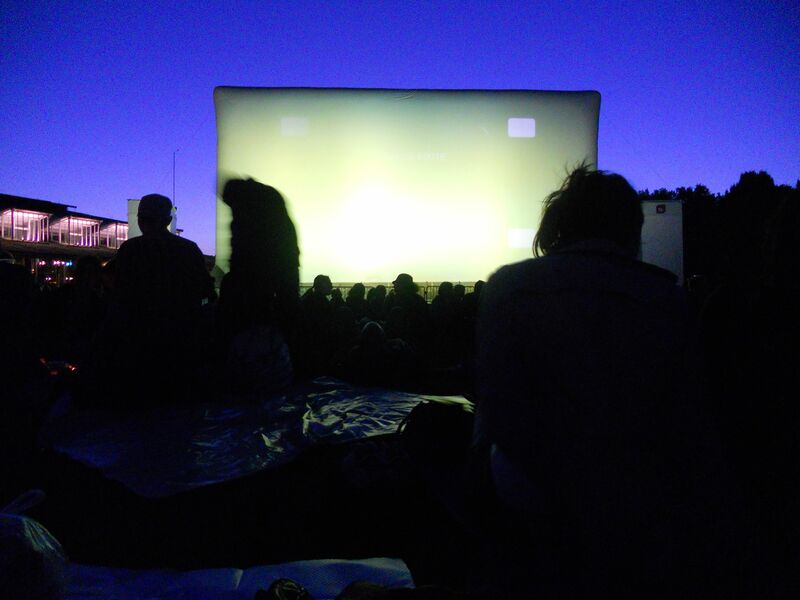 Ciné en Plein Air (Movies Outdoors) — a great way to enjoy part of your vacation/staycation in Paris. Cool activities like this aren’t limited to the summertime. Mayor Delanoë is also well known for implementing Nuit Blanche or White Night – one evening in October when all public and private museums, art galleries, and cultural institutions are open all night long until dawn. Inaugurated ten years ago, this event allows Parisians to reclaim their city by inviting everyone to enjoy their civic and cultural patrimony – for free! Even Paris itself comes to life as a living art space where artists and performers share their talents throughout the city. 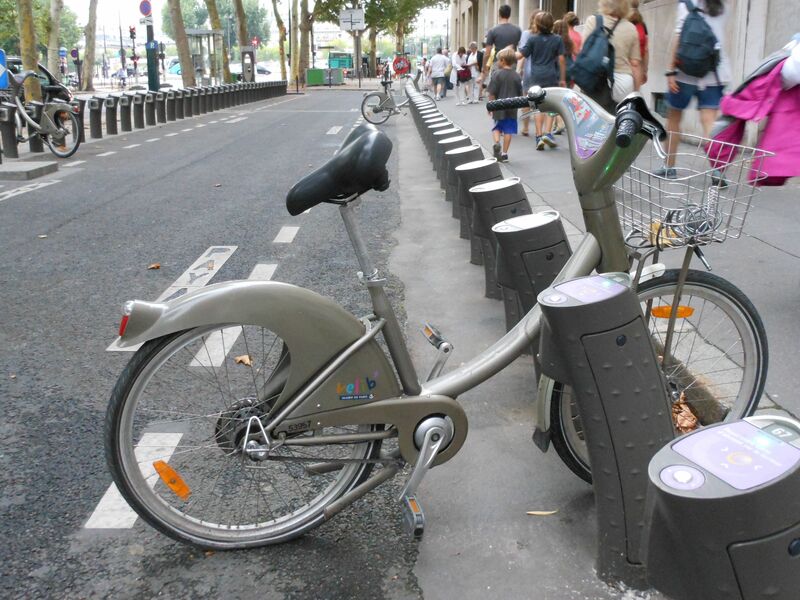 Vélib is so popular, it can be challenging to find any available bikes. 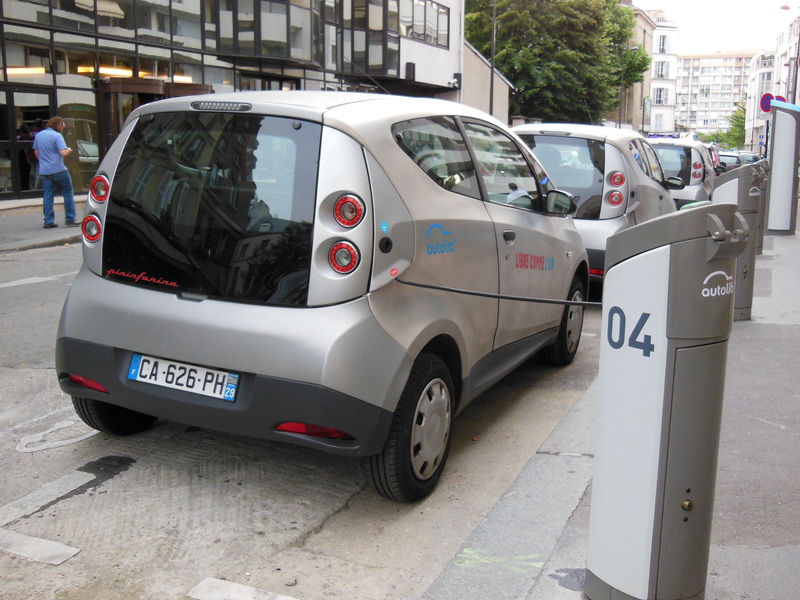 Autolib’ cars stand at the ready, docked at charging stations throughout Paris. And that’s a smart thing to keep in mind as a traveler, no matter where you go. Inevitably, glitches come up every now and again when you’re on vacation. Turn them into advantages. Find a way to make it happen. If you can’t find a place for lunch, head to the farmers’ market to pick up some goodies for a picnic. If museums A, B, C, and D on your list are too crowded, go instead where the lines are virtually non-existent at museum Z and have a more intimate and, perhaps, better experience. Remember that your time and your money are commodities, and neither should be wasted on things that will only frustrate you. Whether you’re away on vacation or just living like a local on “staycation”, whether it’s your virgin visit or you know the place like a pro, find alternate ways to enjoy the place you’re visiting. You have the opportunity and the choice to do something beyond the ordinary, so make the best out of being where you are. Get rid of your checklist, discover and enjoy the abundance of things that that place has to offer – not only to its visitors but especially to its locals, and create your own memorable experiences. Words of wisdom not only for traveling but for Living!! Thanks!! I love your enthusiasm and encouragement! Thanks so much! !